If you've ever strolled along the Promenade of Rockefeller Center, running from Fifth Avenue to the Rink, then you've taken in the beauty of the Channel Gardens, glowing with angels in the Christmas season, and vibrant with fountains and flowers in the spring. And if you've happened to wonder about the origins of the gardens' name, it's inspired by the English Channel running between the south of England and France—countries represented by the British Empire Building on the north side of the Plaza, and La Maison Française on the south. We've previously delved into French from A to Z at Rockefeller Center, but British culture is still well-represented all around the complex. British Empire Building: During the founding of Rockefeller Center, John D. Rockefeller Jr. put great emphasis on establishing international ties and strengthening global trade, particularly with European powers. Out of this ambition, the British Empire Building was built on Fifth Avenue and 50th Street. Above the 620 Fifth Avenue entrance, the 1933 sculptural panel, "Industries of the British Empire," designed by artist Carl Paul Jennewein, is still prominent. Gilded human figures representing Salt, Coal, Fish, Sugar and Tobacco, among others, adorn the bronze surface. Read more about it here. Christie's: The history of this renowned auction house goes all the way back to 1766, when founder James Christie hosted his first sale in Pall Mall, London. Its New York location moved to Rockefeller Center in 2000 to serve as the U.S. flagship, and has hosted many a record-breaking sale in the years since. Just this past November, the purchase of English painter David Hockney's "Portrait of an Artist (Pool with Two Figures)" for $90.3 million set a world record for a painting by a living artist. Kicking off 2019, previews begin January 25 for the Old Master & British Drawings auction, taking place January 31. Penhaligon's: Fittingly, three years ago the British Empire Building became home to the first NYC branch of this London-based perfumerie. Founded in 1870 by William Penhaligon, the brand built its reputation as a perfumer to royalty, and its signature scents evoke journeys all over the world. Stop into the chic little Rock Center shop to sample scents like Juniper Sling, Empressa and Cornubia, as well as cheeky newcomers in the Penhaligon's Portraits series, such as The Coveted Duchess Rose and The Revenge of Lady Blanche. AllSaints: Thoroughly contemporary, this British fashion house offers stylish pieces with an edge for women and men. Think biker jackets, leather blazers and merino hoodies with a ram-skull logo. Also check out shearling boots, thick-soled sneakers and other streetwise winter footwear. 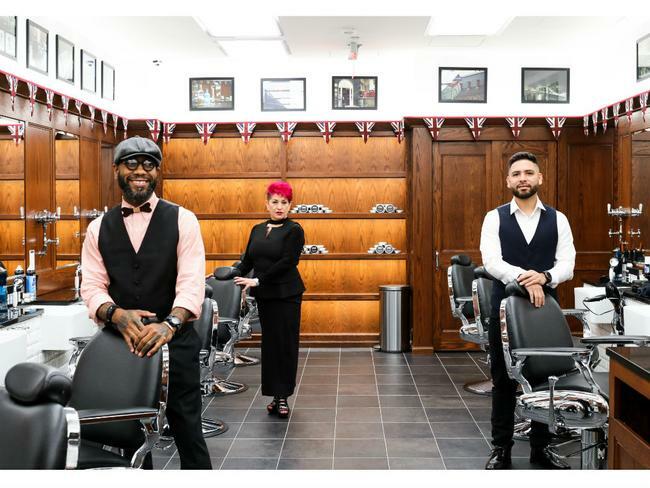 Pall Mall Barbers: Tucked into the Concourse, and decorated with handsome Anglo touches, this NYC offshoot of a longtime London barber shop (founded in 1896) offers top-tier men's grooming services ranging from haircuts to shaves to beard trims. (Rock Center tenants who've booked a haircut can also add on a free 15-minute hot-towel relaxation treatment.) Read more about how its award-winning owner learned about Pall Mall's history. Afternoon Tea and Skating: The Rink at Rockefeller Center offers a number of dining packages to complete a whirl around the Rink. The afternoon tea option puts a twist on an English tradition, providing a 3:30pm repast at the Rock Center Café, facing the ice. Nibble tea sandwiches and sweets (such as mini blueberry scones and checkerboard cookies) to go with your choice of Harney & Sons teas, coffee or hot chocolate, then lace up your skates for a 4:30pm session on the Rink.